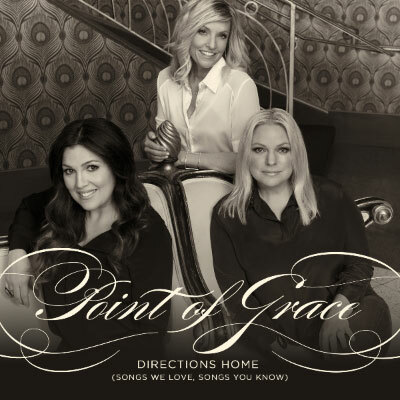 April 2, 2015, Nashville, TN--Just a few days before the release of their eagerly anticipated new album and first covers project, Directions Home (Songs We Love, Songs You Know), GRAMMY®-nominated vocal group Point of Grace takes fans inside the creation of their new album, debuting exclusively on CountryWeekly.com. With career sales exceeding 8 million albums, the group's signature harmony has been the foundation of their sound. Those harmonies are the driving force behind the album that is a collection of cover songs that have special meaning to Point of Grace and their fans. "We each had to bring in songs that we wanted to cover," shares member Leigh Cappillino. "We immediately realized that all the songs related to the journey of life." Directions Home (Songs We Love, Songs You Know), is the result which features special guests 14-time GRAMMY® winner, Ricky Skaggs and 20-time GRAMMY® winner VInce Gill. The album came to life under the direction of co-producer, GRAMMY® Award-winning musician, Andy Leftwich. The behind the scenes video goes inside the production process and captures poignant moments and memories as the ladies share the heart behind the album, and a career that spans years and thousands of miles on the road performing for their fans. "Our main thrust has never changed," offers Shelley Breen. "We love God and we love people." That feeling is reciprocated by fellow artists who appear in the behind the scenes video, paying tribute to a group that has had a monumental impact upon their careers. Skaggs says, "Of all the groups out there, I remember Point of Grace because their harmonies were so good." Other artists include Dove Award winning artist, Meredith Andrews and acclaimed singer/songwriter Cindy Morgan. The special inside look into Directions Home will run for 24 hours exclusively on CountryWeekly.com, beginning Thursday, April 2. The album releases Tuesday, April 7. Point of Grace is currently co-headlining the You Amaze Us tour with Curb recording artist, Selah. Full tour schedule and ticket information is available here.